Richard Larson. 2010. Grammar as Science. MIT Press. This introductory text takes a novel approach to the study of syntax. Grammar as Science offers an introduction to syntax as an exercise in scientific theory construction. [Grammar as Science] shows students explicitly how to ‘think like a linguist.’ Students who use this book will come away with an extraordinarily strong grasp of the real underpinnings of linguistics. The key here is “think like a linguist”. If you’ve ever tried to take Chomsky’s conception of grammar from Aspects and explain it to students (which I’m embarrassed to admit that I have done in the past), you’d have your doubts about the relation between “think like a scientist” and “think like a linguist”, too. What makes modern generative linguistics a science, and an interesting one at that, is a subtle interaction among several factors: the questions that it asks, the abstractions that it makes to answer these questions, the technical apparatus it uses to make these questions precise, the evidence it uses to adjudicate between different answers, and the aesthetic that animates it when putting all these ingredients together. Silly me. Here I was thinking what makes something interesting science is predictive power. One piece of very good advice for writers in any genre is show, don’t tell. Sci-fi writers and linguists seem to have a particularly hard time following this advice. I’m afraid the newbie/off-worlder/woken-up-from-cryosleep listener who has everything explained to him obeys the letter but not the spirt of the dictum. That’s similar to “serious” texts where thin characters have a “dialogue” that’s a proxy for the author explaining to the reader. Examples include Gödel, Escher, Bach in logic/AI (which I loved when I was in high school when it came out) and Rhyme and Reason in linguistics, which covers very similar “philosophy of science” ground as Grammar as Science. I’ve never seen a physics or chemistry or even a biology book start off by asserting that what follows is really science. Most scientists, and most scientific texts, just do science. Methinks the linguists do protest too much. * The following are real, though I’m too lazy to link past the first: Anime and Philosophy, Star Wars and Philosophy, Alice in Wonderland and Philosophy, The Matrix and Philosophy, Facebook and Philosophy, Transformers and Philosophy, Batman and Philosophy, The Undead and Philosophy and so on (and on and on). Is this some kind of works project for philosophers? This entry was posted on September 29, 2010 at 12:29 am and is filed under Carp's Blog, Reviews. You can follow any responses to this entry through the RSS 2.0 feed. You can leave a response, or trackback from your own site. “If I ever use a textbook, it would be this one”. He almost certainly never will. – linguists have to ‘protest’ because language studies are traditionally in the humanities, but there are large parts of linguistics that is scientific. – A thirty year old book by Soames and Perlmutter: “Syntactic Argumentation and the Structure of English” presents generative syntax in a hypothetico-deductive framework pedagogically (i.e. to present some language patterns to the student, explicitly present some data, make an hypothesis, generate some sentences and (have the student) see if they are OK). Check your spam filter. Blogger is now automatically tagging some comments as spam. That long comment probably got blocked. I had to put up a warning on my blog. Not that it did much good. I still get heaps of vitriol from certain segments of the psycholinguistics community that are sure I’m deleting their “comments” (read “excessively long rants that look like spam if you’re a spam filter…and possibly even if you aren’t”). Wow, I wouldn’t have thought your blog would offend anyone. I do check the spam traps every few days. I do respond to e-mail, when that’s not spam filtered. It’s the new “lost in the mail”. I’m curious which aspects of Aspects strike you as non-scientific (I admit I haven’t read it; I don’t spend much time on syntax). I’d hesitate to paint Linguistics with such a broad brush though. These days Linguistics departments include a lot of great scientists doing great experiments … even great experiments on syntax (though, again, I personally follow the semantics work more closely). You’re right — the linguistics community is more heterogeneous than I implied. Linguistics should be, in my opinion, a branch of psychology on the one hand, and sociology on the other. Language is, after all, a tool humans use for communication. Aspects led the entire field down the garden path with the introduction of the “competence”/”performance” distinction combined with an emphasis on competence. 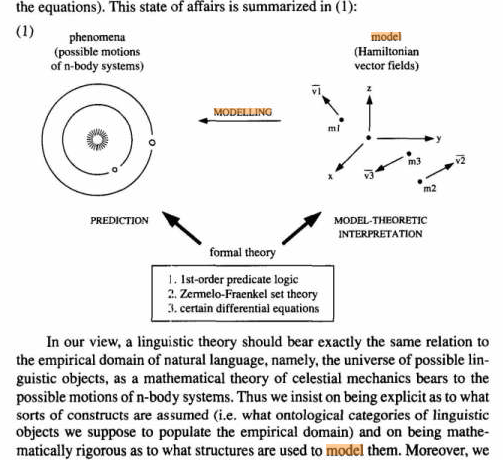 It’s thus unclear where linguistic theory connects with what other sciences think of as “data”, such as observations of humans using language. In order to “understand” competence, you need to “think like a linguist” rather than “think like a scientist”. This is because the whole thing’s fundamentally non-empirical (except in the loosest armchair experimentation sense). The focus on competence makes it completely irrelevant what people do with language. Sure, linguists say they’re working on a theory of learning, but it sure doesn’t look like their hearts are in it. The biggest giveaway is that mention of learning and human cognition only arises in introductions intended to show that what follows is about something someone might care about. “Performance” is an all-too-convenient rug under which to sweep anything that doesn’t agree with “linguists’ intuitions”. And the problem with linguist’s intuitions is that they’re not measurable in any scientific sense — you just have to ask a Chomskyan linguist to get a so-called “judgment” about the form of the competence grammar. Perhaps not surprisingly, as the theories change, so do the intuitions. I’m not sure whether it was Aspects or later work that put so much emphasis on “universal grammar”. It strikes me as a canonical example of an argument by lack of imagination (i.e., I can’t imagine how the cognitive mechanisms of an embodied agent could learn language, therefore it must be innate). I can’t even follow the thread of argument that leads people to believe there are only finitely many possible human languages — the whole idea just seems absurd. I love studying language, but the state of linguistics has always made me sad. I hear from some people that linguistics is heading in a more empirical direction and that you can actually talk about the function of language and even frequency of use rather than only structure and an abstract notion of grammatical competence that is by definition divorced from performance as an object of study. Other people (such as a recently minted junior linguistics professor at a major university I spoke to yesterday) tell me that’s only a few isolated instances, like Joan Bresnan’s recent work. Well, Linguistics is a big field and I don’t have a bird’s-eye view. But there are certainly a lot. Chierchia and Polinksy at Harvard. Jeff Lidz at Maryland. Elsi Kaiser at USC. Andrew Kehler at UCSD and former students of his at various places. Tom Roeper at UMass. Ray Jackendoff has been hanging out with a lot of psychologists and has at least one student running experiments. Alec Marantz has been doing experiments since forever, and I categorize Liina Pylkkanen as a linguist, though I don’t know how she self-describes. Those are just the ones I’ve talked to recently enough that they pop readily into mind, but there are many more, so apologies to people who simply aren’t coming to mind at the moment. I should add — I think beating up on linguists not a good strategy in terms of changing their minds, and it’s probably annoying to the people who *do* do experiments. So though there are things I’d like to change about the field — and things I’d like to change about my own field — I try to give credit where it’s due. Right again. This is hardly a productive line of inquiry. Rarely does anyone change their mind due to an argument. Luckily, I don’t think many linguists care one way or the other about what I think. Judgments are certainly empirical data about the psychology of linguists. I actually do think they’re just making stuff up at the border, which is where all the action is. It’s one of the main reasons I left the field. What’s so frustrating is that some linguists won’t accept what people say or write as data that could help decide the issue. Thanks for the names. Do you have particular examples of papers that you think exemplify a more empirical trend? rational investigations of language. I doubt he needs a textbook. Others might want one. It’s the Santa Cruz way. My wife was a grad student in their linguistics department until she left the field. I think a large part of that was not understanding what they meant by learning how to think like a linguist (she’s now in bioinformatics). She thought their use of the Socratic method was disengenuous in that it was intended to show that thinking about “data” led one naturally to the (Revised Extended) Standard Theory or GB or the Minimalist Programme. If you did the exercises and came to the “wrong” judgments or trees or transformations, you were set to rights (i.e., agreeing with the theory they’d chosen) in the next class. Fair enough. That’s a stronger piece of evidence about Hankamer’s class than any which I have. It’s pretty clear that a Socratic teacher with preconceived ideas of what must emerge would not be playing the game according to the rules under which it is supposed to be played. I don’t think Jorge was teaching the syntax classes she took. And I should add that she did take something having to do with morphology with Jorge and loved it. He’s truly an iconoclast. I should add that I don’t object to the Santa Cruz Linguistics teaching style itself. I’m not enough of a classicist or philosopher to know if Socrates himself an agenda for what he wanted his students to learn when he used the Socratic method. Also, I should add that I really like the idea of giving the students the problems first, having them chew them over, then looking at the answers. Lots of math books have this style implicitly, usually by introducing exercises (often with hints) that bridge the gap between the current section and the next. I would buy and read “Grammar as Proto-Science” or “Grammar as Cargo Cult Science”. Also “Socrates and Philosophy”. You’re right that syntax and phonology have this weirdly apt inferiority complex that manifests itself in the form of lectures about scientific methodology. This has been one of Geoff Pullum’s pet peeves for a long time. Paraphrasing: why do syntacticians keep talking about philosophy of science, instead of talking about syntax? Since you bring up HPSG: it doesn’t really solve the “science” problem of syntax. Sure, it’s got the big picture right, and it’s formally rigorous enough that one can at least tell what a theory is actually saying. But other than that it falls into the same traps that have stymied the field for the past 60 years: not nearly enough focus on data, disproportionate attention to infrequent phenomena, and little insight into what its empirical object of study should be.